Rochester, Minn. — (AP) U.S. Rep. Gil Gutknecht said Friday he would run for re-election to the House, ending the possibility of a primary fight between two Republican congressmen for the U.S. Senate seat being vacated by Mark Dayton. "I love the job I have in Washington and I just feel like I fit more in the House of Representatives than I would fit in the Senate," he said. "If the voters of southern Minnesota will allow me to do this, I would like to run for re-election." Shortly after Dayton, a Democrat, announced that he would not seek a second term Rep. Mark Kennedy announced he would run for the seat. He has picked up the backing of U.S. Sen. Norm Coleman and 26 state senators. 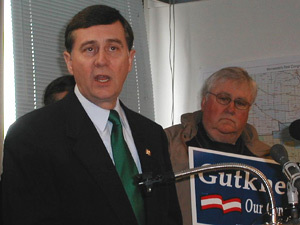 Gutknecht didn't endorse Kennedy on Friday. "It's too early to predict who will ultimately emerge as the Republican nominee," he said. "I am confident that whether it's Mark Kennedy or someone else, we will find a very strong candidate." Former U.S. Sen. Rod Grams, whom Dayton defeated in 2000, is the only other GOP candidate. No Democrats have officially entered the race, although children's safety advocate Patty Wetterling and Hennepin County Attorney Amy Klobuchar have taken steps toward creating campaigns. Other potential candidates include Minneapolis attorney Mike Ciresi, U.S. Rep. Betty McCollum, University of Minnesota general counsel Mark Rotenberg, state Rep. Tom Rukavina, former state Sen. Jerry Janezich and outgoing DFL Chairman Mike Erlandson. After Gutknecht's 1994 election, he pledged to serve no more than 12 years. Last May he backtracked on that statement, saying term limits hadn't been universally applied and voters should be the ones making the decision. Gutknecht has pushed for allowing Americans to import cheaper prescription drugs from Canada and other industrialized countries, drawing opposition from GOP leadership and the White House.